I began this book slightly biased against Caroline of Brunswick, as I’ve read of her in other books and articles. Leave it to Jean Plaidy to turn one’s opinions around completely, and simply by telling the facts in an amusing and straightforward manner. I had a similar experience with her novel Madame du Barry. Caroline’s life started in Brunswick, Germany where her father was Duke and mother was King George III of England’s sister. She and her elder sister were not brought up properly, mostly due to her mother’s negligence owing to her own sadness: a home where her husband’s mistress reigned supreme and several of the royal children had disabilities. Caroline grew to be wild, completely extroverted and indiscreet. She did, however, have a very kind heart and was not purposely hurtful toward others. Once she became betrothed to the Price of Wales, she began to look forward to a new, exciting life in England. It was not to be; the Prince disliked her on sight and showed it in the most humiliating ways possible. As soon as Caroline carried the heir to the throne, he separated from her and tried his best to make her life miserable. 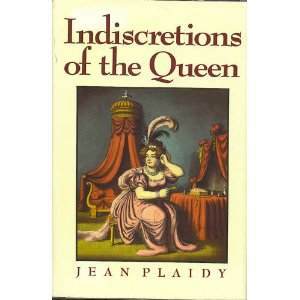 George IV was a despicable character in this book! He was completely selfish, taking and discarding mistresses (and wives) at his whim and thinking of nothing but fashion, etiquette and where he can find money to live his extravagant lifestyle. Marriage with a lady who was not Catholic was a necessity for both his popularity and his pocket, as well as the getting of an heir to the throne. Though he had 12 siblings, none of his brothers had produced legitimate children and his sisters mostly remained unmarried, and so he felt he must do his duty to further his dynasty. Unfortunately for Caroline, George chose his bride blindly. Even though life had dealt her a bad hand, she made the most of her situation, entertaining friends and endearing herself to the English people through her charity and genuine affection for all children. The old King, George III, was her friend and many political figures flocked to her, as she was the future queen and much more popular than her husband. If only the Prince would have let her alone she would have been content with life. Caroline’s story is uproariously funny at times and quietly sad at others. Her character is one who can inspire both exasperation and adoration – a strange combination. She was truly an admirable Queen of England.